With the discovery of the mirror neuron in the 1990s by Italian scientists as evidence we are hardwired to practice the skill of empathy, we took up the challenge of writing a program that didn’t tell students what they shouldn’t do, but gave them meaningful experiences to practice the virtue of empathy. To support our efforts toward building and sustaining empathy we found that respect for self and others is foundational (or our starting point) and a regular practice of gratitude would move students toward positive habits (fuel for the journey). The framework of empathy easily correlates to reducing aggression; if a student can relate to another’s experience he/she would be less likely to show aggressive behavior. But could we teach this skill and cause change? And how would we measure it? Some said, “...measuring something concrete like math is easy, measuring a virtue like empathy is near impossible.” But the way we treat each other is the basis for everything else; it can affect learning, politics, and societal norms for entire generations. We felt empathy so essential to being human, we set out to prove that we can teach a virtue and cause change. Our conviction is that the best education provides youth not only with the academic skills they need to be successful, but also the social tools needed to navigate this world. An education in empathy shows students that seeing the world through another's eyes is essential to personal growth. To practice and experience walking in another’s shoes demonstrates the importance of shedding at-risk behaviors in order to help others. When empowered to find empathy opportunities students will build self-worth by contributing to a cause greater than themselves. In the 2016-2017 school year, the Path2Empathy Program (P2E) was tested in a middle school that is set up in the middle school model with 3 academic teams of 6th, 7th, and 8th grade students. These students ranged from the age of 11-14 years old. Path2Empathy used the natural separation of academic teams at the middle school: 2 test groups and 1 control group first semester and 1 test group and 2 control groups second semester. The tool used as our measure was administered school wide four different times throughout the test (Survey 1, 2, 3, 4). Survey 1 was administered prior to the P2E implementation, Survey 2 and 3 during implementation, and Survey 4 after implementation was complete (twice each semester). Path2Empathy did not choose which students were placed on teams A,B,C. This process is done at random by the test school before the school year started. Each team has a variety of learners: regular education students, gifted students, special education students, english language learners, free/reduced lunch students, and racial diversity. None of the students at the test school had been exposed to the Path2Empathy program prior to the 2016-2017 school year. The first semester of the 2016-2017 school year the A and C (A/C) teams were chosen randomly to be the test groups while the B team was the control group. The classroom teachers of the A/C teams, 6th, 7th, and 8th, delivered the Path2Empathy lessons while the 6th, 7th, and 8th grade B teams were not given the lessons. The second semester of the 2016-2017 school year the B teams were chosen randomly to be the test groups while the A/C teams were the control group. The classroom teachers of the B teams, 6th, 7th, and 8th, delivered the Path2Empathy lessons while the 6th, 7th, and 8th grade A/C teams were not given the lessons. The survey was available to every student but every student did not take all four surveys. Some students were unable to take the test due to absences, teacher error, they opted not to, or they were identified incapable to give a valid response resulting in elimination of their surveys. Using a Difference in Differences (DID) statistical model all survey pairs were analyzed for the effect of the P2E curriculum on student identification with empathy. We infer from survey 3 to survey 4 results that the Path2Empathy Program was causal in producing a significant shift in the way Team B students identified with empathy compared to Team A/C (as illustrated above). Teams A/C did make growth in identification with empathy but it was not statistically significant. 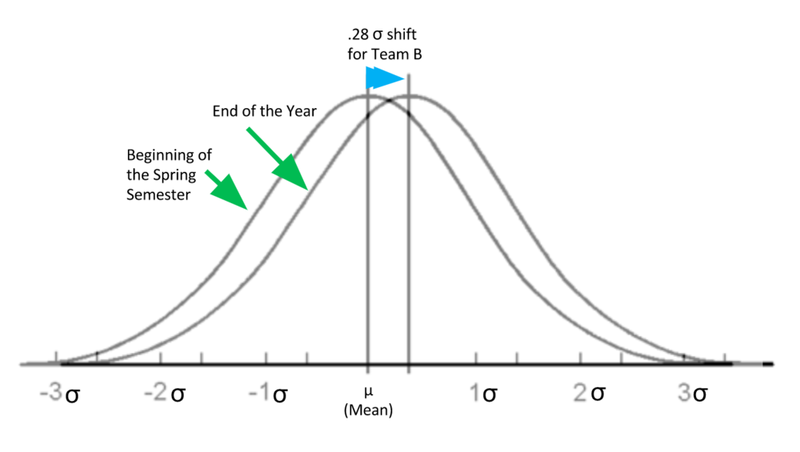 We recognize the delay in response from teams A/C may be due to a variety of factors. The implementation of Path2Empathy was new to the A/C team teachers in the fall of 2016, while the B team teachers were able to watch the A/C teachers implement and ask questions before they taught the lessons in their classrooms. We conclude that the Team B kids had second-hand exposure during the fall and direct exposure during the spring term which allowed for reinforcement. A/C however, had no second-hand exposure prior to direct exposure in the 1st semester. Also, factors such as the fall 2016 presidential election may have had some effect on students’ responses. When looking at the behavioral trends of the school from the year before Path2Empathy was implemented to the year Path2Empathy was being taught in the classroom both harassment/discrimination and defiant/disobedient behavior went down. *Disclaimer: Path2Empathy did not seek to measure Defiance/Discrimination. These are trends that were noticed in separate behavioral data collected by the research school independent of the Path2Empathy study of empathy. *Disclaimer: Path2Empathy did not seek to measure harassment/discrimination. These are trends that were noticed in separate behavioral data collected by the research school independent of the Path2Empathy study of empathy. We felt it important not just to reference the statistical numbers but also the qualitative data, or what students and teachers have reported about Path2Empathy from a variety of P2E schools.